Marvel Comics' greatest villains will have a great Thanksgiving for the first time in eight years. Just a day after the solar eclipse enchanted North America, Marvel Comics released its grand plan for its November. However, after previewing several titles, it looks like Marvel Legacy is more or less "Dark Reign: II" as several of the House of Ideas’ greatest villains now have the upper hand on everyone’s favorite heroes. Who are the villains that scored significant victories against their longtime adversaries? What are the stories that will start conversations at both comic book shops and the kitchen table? GEEKS has all the answers, so read on to find out! Yes, you read that correctly…The God of Mischief is now the Sorcerer Supreme! What happened to Stephen Strange? Why is Doctor Strange’s assistant, Zelma, working with Loki? Will the powers go to Thor’s brother’s head? Find out as the new creative team of writer Donny Cates, and artist Gabriel Hernandez Walta present the 381st issue of Doctor Strange. Marvel’s greatest villain is now heading to victory road! What happens when the Mad Titan finally defeats his archrivals? Writer Donny Cates and artist Geoff Shaw will reveal the answers in Thanos #13. A brand new Sinister Six menaces Miles Morales. Miles Morales is about to face his ultimate challenge in the form of the Sinister Six! The mysterious Iron Spider has recruited Bombshell, Hobgoblin, the Spot, Electro, and founding member Sandman to complicate the former Ultimate Spider-Man’s life. Miles’ co-creator, writer Brian Michael Bendis, welcomes artist Oscar Bazaldua and cover artist Patrick Brown into the Spider-Man family in issue 234. Peter Parker: Threat or Menace? Miles should not expect his mentor, the original Spider-Man, to help him face off against the Sinister Six because Peter Parker is in hot water. The New York Police Department has made Peter Parker person non grata in his friendly neighborhood and has vowed to put the former Parker Industries leader behind bars. Writer Chip Zdarsky and artist Adam Kubert present part one of “Most Wanted” in Peter Parker: The Spectacular Spider-Man issue 297! If you thought Mayor J. Jonah Jameson was a disaster, then try Mayor Wilson Fisk! The Kingpin of Crime has been elected by the New York City residents to become the next Mayor. One person that is not taking this news lightly is Matt Murdock—the legendary Daredevil. How will the Man Without Fear begin the campaign to take his longtime nemesis down when Mayor Fisk has every New Yorker at his disposal? Writer Charles Soule and artist Stefano Landini welcome back one of Daredevil’s iconic creators, Bill Sienkiewicz, to launch this new and challenging chapter in Daredevil issue 595. One of the X-Men’s greatest adversaries, Mister Sinister, has set his sights on the Inhumans. The diabolic geneticist wants to study the Inhumans and will do anything to find out how they are superior to mutants. 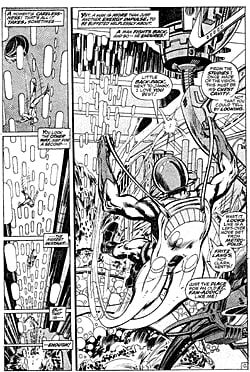 However, his arrival comes at the worst time possible for the Secret Warriors as the legendary Karnak leaves the team. Can the remaining Secret Warriors prepare themselves for Mister Sinister’s deadly attacks? Writer Matthew Rosenberg and the art team of Javier Garron and Will Robso will present part one of “Versus Mister Sinister” in the eighth issue of Secret Warriors. The Uncanny Avengers team is broken thanks to the events of Secret Empire. As the team tries to rebuild, longtime X-Men foe, the Juggernaut, makes his unwelcome return to the Marvel Universe. Can the team set aside their differences and take on one of the greatest powerhouse threats that any hero can tackle? Writer Jim Zub and artist Sean Izaakse present part two of “Stars and Garters” in Uncanny Avengers issue 29. 'X-Men: Gold' visits the Negative Zone. The veteran X-Men team has no time to relax from their confrontation with Mojo. Aliens have risen from the far depths of the Negative Zone to kidnap an X-Man and bring them back to the uncanny dimension. Writer Marc Guggenheim and artist Lan Medina present part one of the new storyline, “The Dartayus Odyssey,” in the sixteenth issue of X-Men: Gold. Captain America's long and winding redemption road begins. Steve Rogers has done a lot of damage over the past two years, and now the original Captain America is about to begin his long journey to redemption after his actions in Secret Empire. The red, white, and blue superhero is back in costume and is on a mission to restore his reputation. Legendary writer Mark Waid and artist Chris Samnee begin the march to the Star-Spangled Avenger’s milestone 700th issue with Captain America issue 695.